With the exception of the white sashing, Treasure Chest was made entirely from scraps. This is Quilt of Valor #72, which makes #22 for 2015. 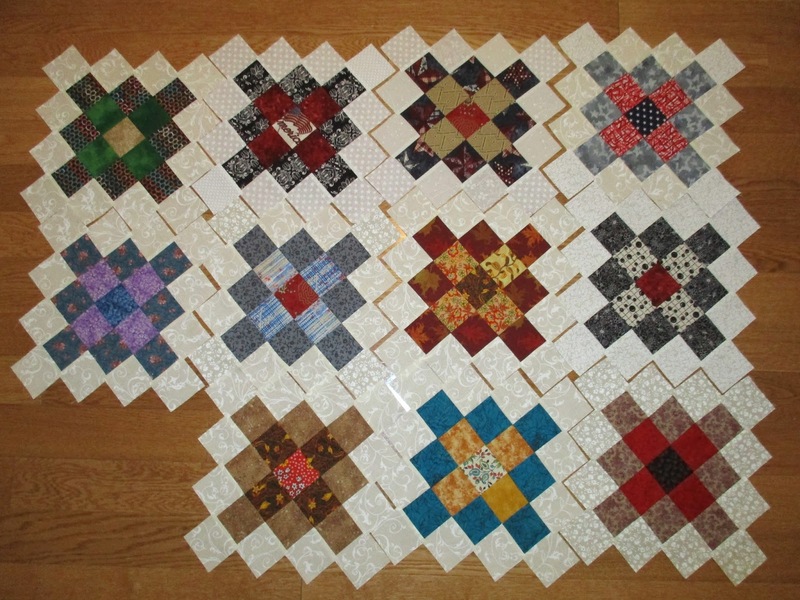 Lori gave me the inspiration to make the Granny Square or Album blocks. Thanks, Lori. 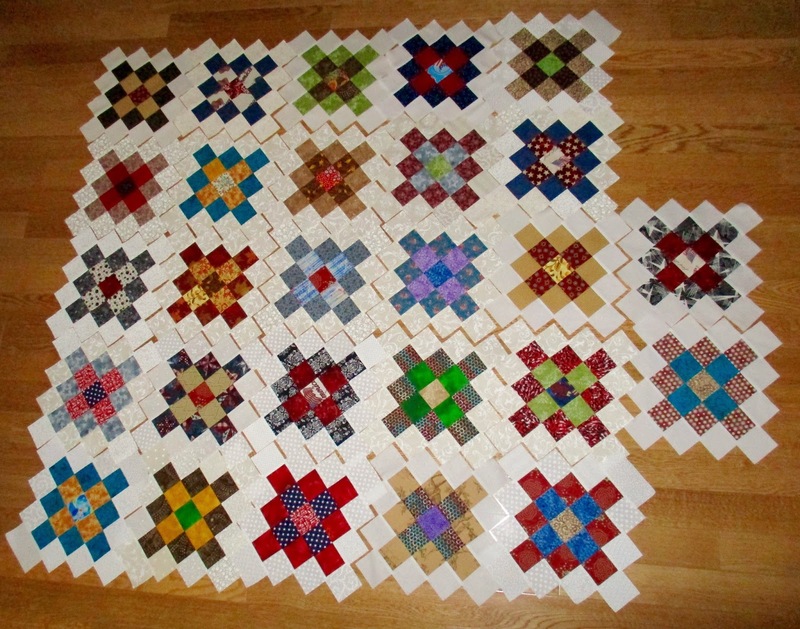 I have plans to make at least one more Granny Square quilt from my 2.5 inch scraps. A complete list of the Quilts of Valor that I've made can be found here. 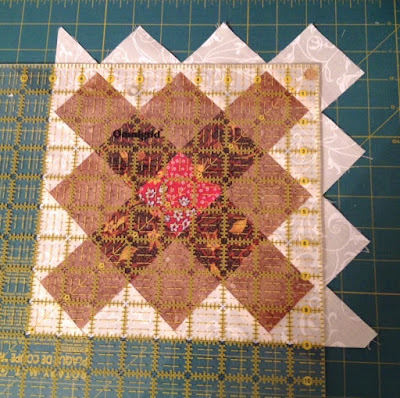 This post is for the non-quilting readers who asked how I was going to sew the zig zag edges of the Granny Square blocks that I've started making with scraps in June. Earlier posts can be seen here. 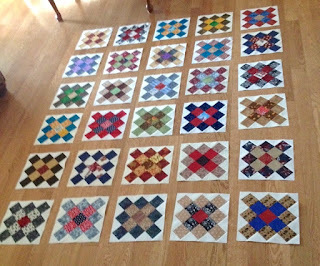 I put the blocks together like a jigsaw puzzle to photograph them, but I doubt ANY quilter would ever attempt to sew the blocks together without squaring them, which is what I did once I had enough blocks for a complete quilt. First, I measured 1/4 inch from the tips of the colored squares. 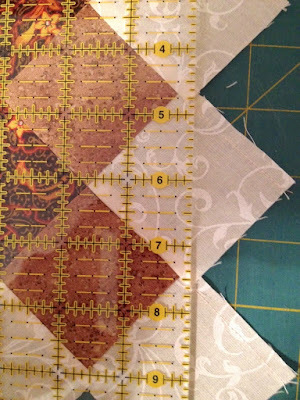 The 1/4 inch is needed for seam allowance. 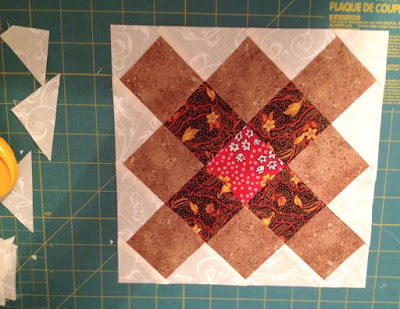 Once the seam allowance was determined, I cut off the edge, rotated the block and measured the other sides - making sure the entire block was square. 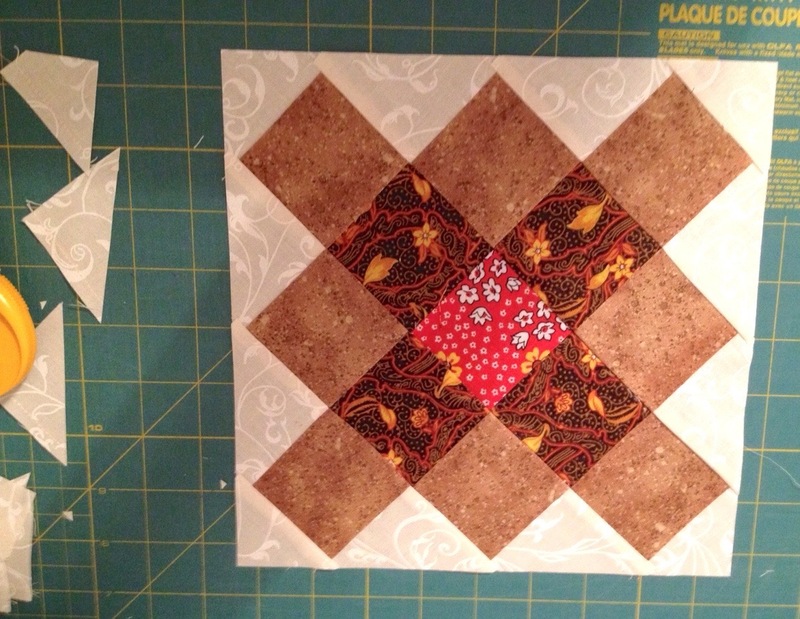 These blocks were trimmed to 9 inches and with the seam will finish at 8.5 inches. 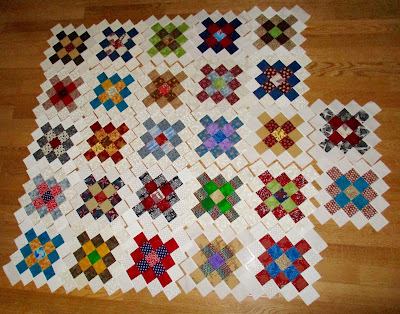 Now, that the blocks are square and are all the same size, putting them together into a quilt top will be easy. "The Cathedral of the Plains"
One of the highlights of the trip for me was visiting this gorgeous church. 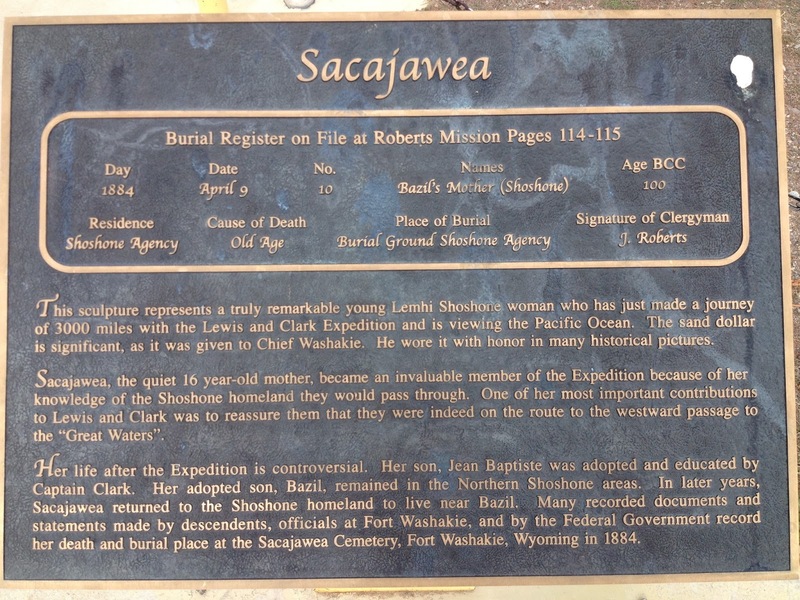 It towers above the small town (population 1,214 in the 2010 census) and has an amazing history. 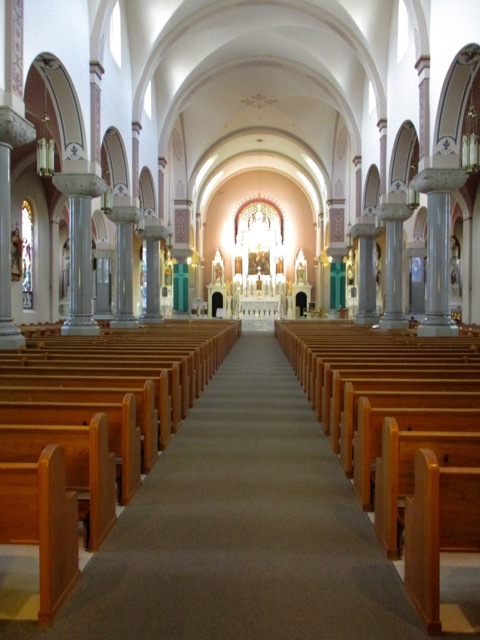 It is 220 feet long, 110 feet wide at the transepts, and 75 feet wide at the nave. The ceiling is 44 feet above the ground and the towers rise 141 feet. 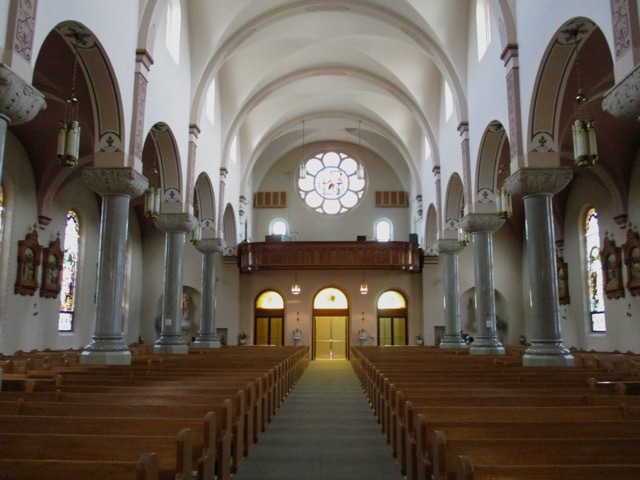 The seating capacity of 1,100 made it, at the time of its dedication, the largest church west of the Mississippi. Construction of the Cathedral began in 1908 and was completed in 1911. The exterior is constructed of native limestone, quarried seven miles south of Victoria. Besides collectively contributing $132,000 for the building, each parishioner was required to haul 6 wagonloads of stone, so large families easily hauled 70 to 80 loads of stone to meet their obligation. 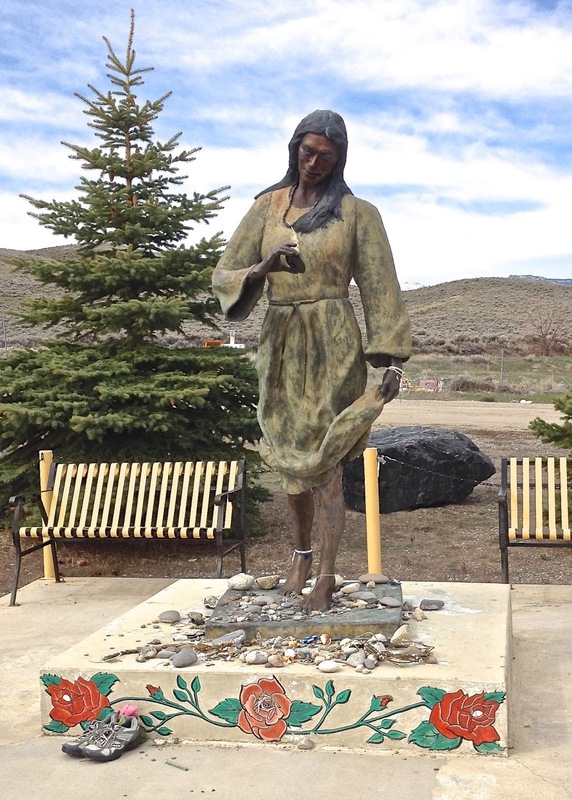 Each stone weighed 50 to 100 pounds and engineers estimate that the people hauled and dressed more than 125,000 cubic feet of rock. 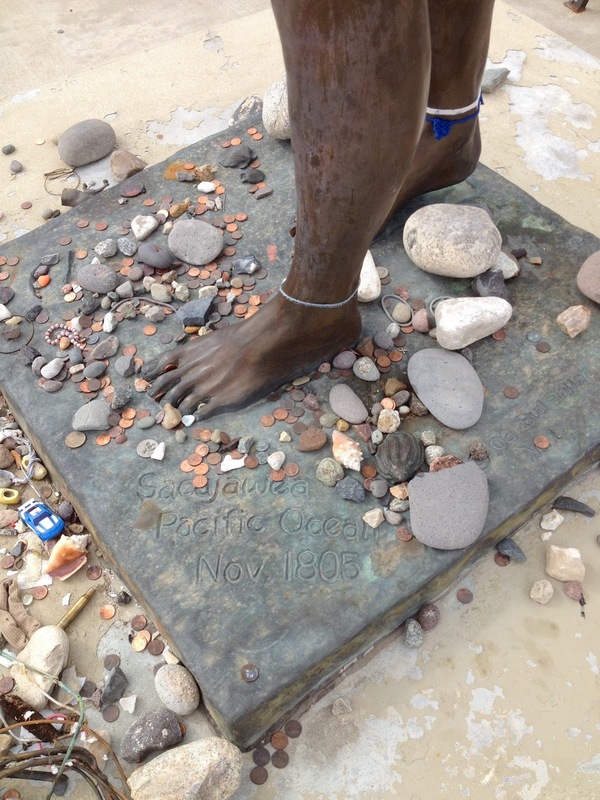 The stones were placed by hand, assisted only by block and tackle. The fourteen granite pillars in the nave came from Vermont. 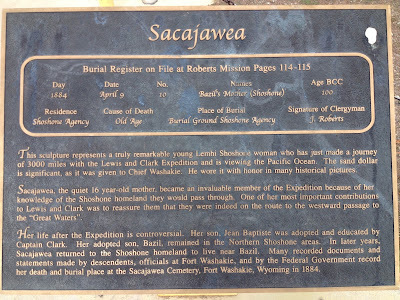 When they first arrived, however, they were unloaded by the railroad 3/4 mile from the construction site. After an attempt to transport the pillars using a strong farm wagon failed, a threshing machine was prepared with beams. It took eight horses, to pull the five-ton to seven-ton pillars and 40 men to lift them. In addition to the native limestone and the granite pillars from Vermont, a great quantity of Bedford stone was imported from Indiana for the doorways and the bases and capitals of the pillars. The stained glass in this church is breath-taking. I photographed a few favorites, but you can click on the link photos of all of the windows. The rose window at the end of the church was amazing. 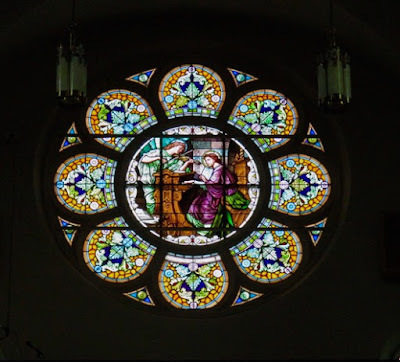 In 2013, the church contracted with Widenborg Stained Glass Restoration to remove the old storm covering on the stained glass windows and refurbish the windows and wood frames. Quarter-inch clear tempered glass was installed as a new storm covering. 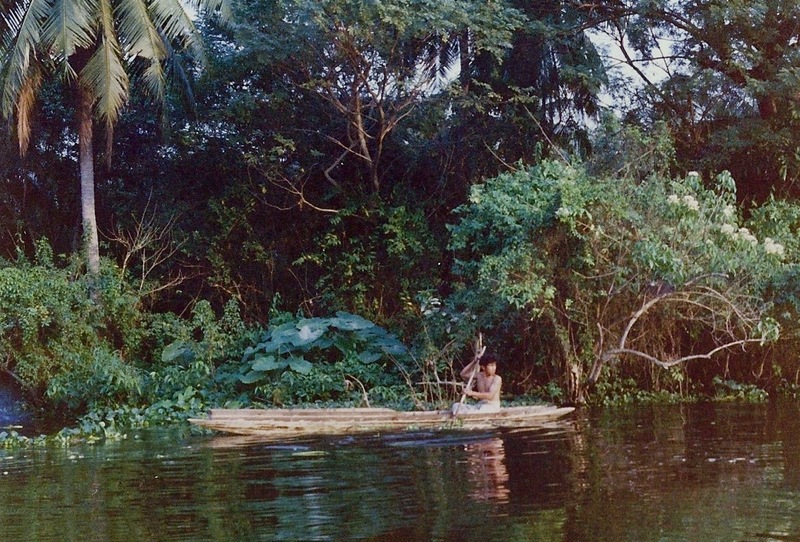 This restoration alone cost $155,000. 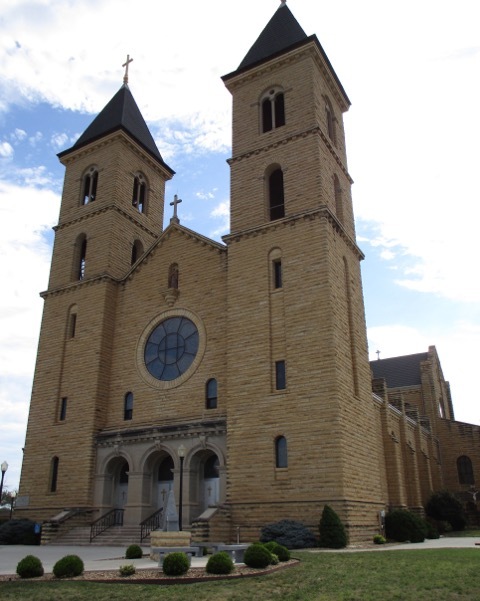 If you find yourself on Interstate 70 in western Kansas, please take the time to stop in Victoria to see this gorgeous church. Colby, Kansas has one of the most impressive museums that I've ever seen: the Prairie Museum of Art and History. We could have spent a day or more looking at the various exhibits in the 21,500 square foot building as well as the display buildings outside the main museum. 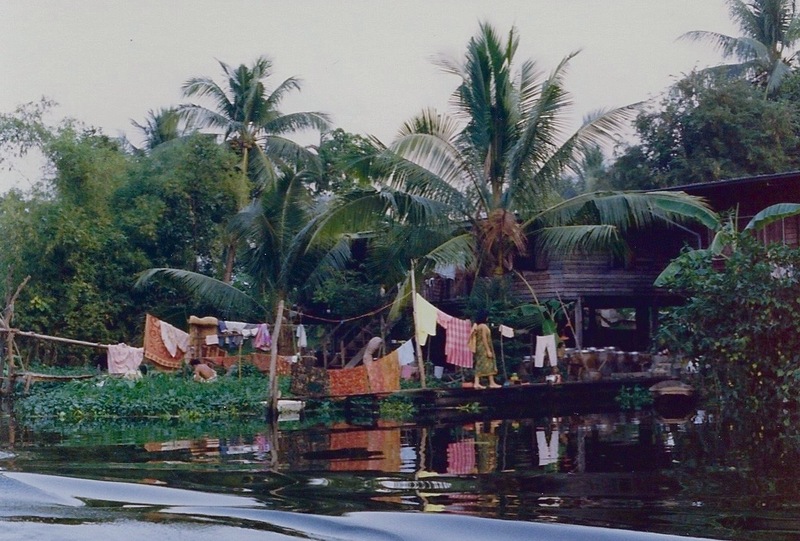 The museum covers 24 acres, and the displays are varied and extensive. Items inside the main building were displayed in glass cases, and under the cases were drawers with could be pulled out to reveal even more items related to that particular display. 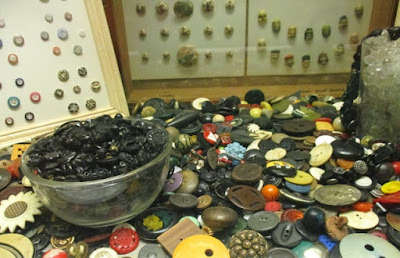 For example, the buttons shown in the photo were in the glass case, and beneath the case were ten or more wide and long drawers with buttons mounted on cards. There were similar displays for stamps, coins, tools, etc. From the museum literature, we discovered that the items in the museum are the collection of Joe and Nellie Kuska. I took a lot of photos and will be posting them randomly. 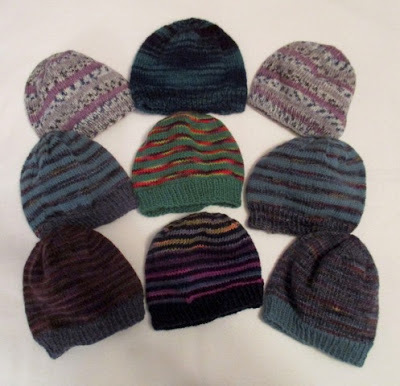 I finished nine baby hats while on vacation - most were knit while on the road and some knit in my downtime. The hats are already out of my house and on their way to Public Health for the visiting nurses to distribute. 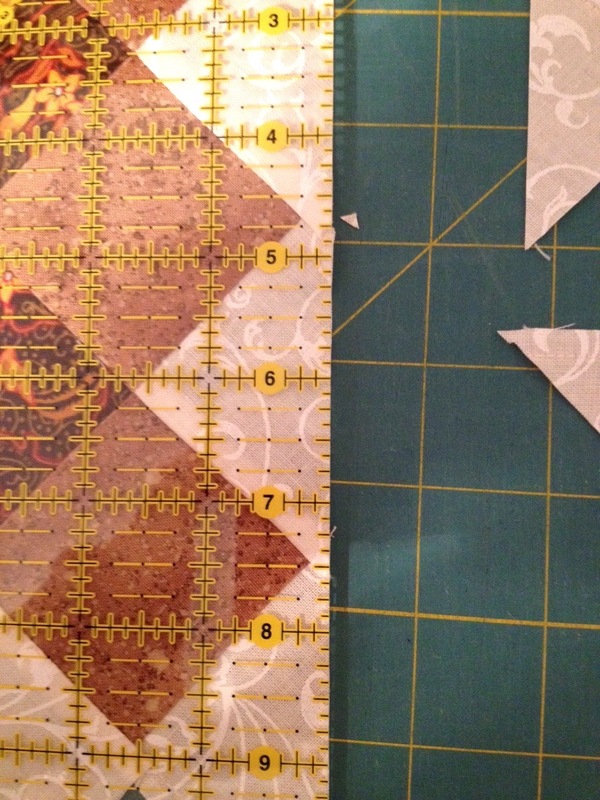 It feels good to use the scraps and to help keep little ones warm. There is a tiny bit left, and it is currently on the needles. 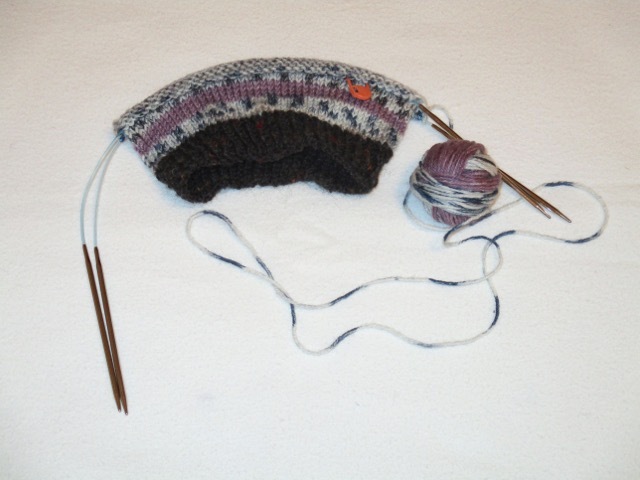 I will probably run out of the self-striping yarn before the hat is finished, so this hat may have a black top. What "windshield time" activities do you do when you aren't driving? Remember all the photos I posted of the Pottery Factory in Taiwan? 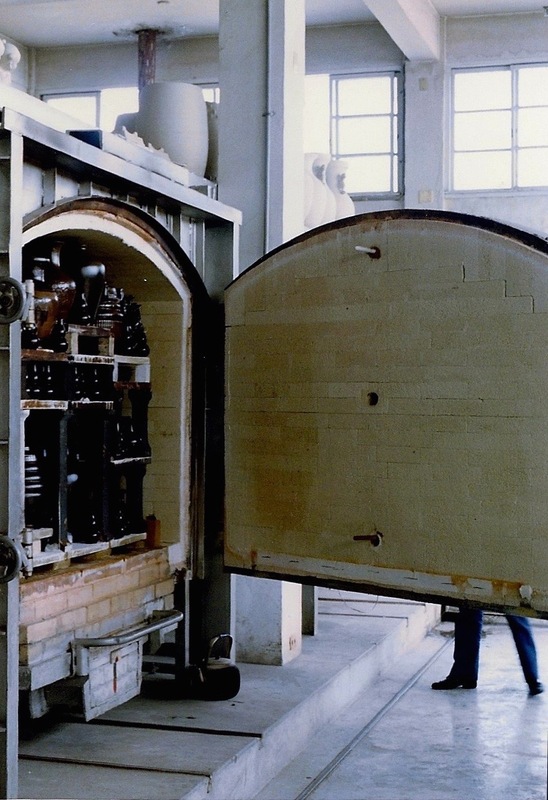 This is one of many kilns used to fire the pottery. They were massive. 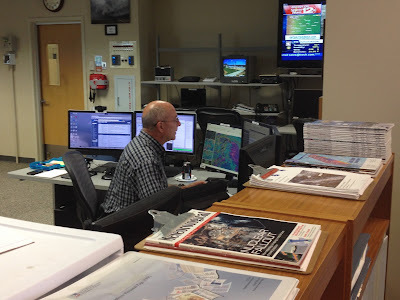 The first stop on our itinerary was at the National Weather Service Weather Station (NOAA) in Goodland, Kansas. We asked for a tour of the facility and Jessica, a young meteorologist, showed us the various radar screens and answered all of our questions about how the weather in that area is predicted. 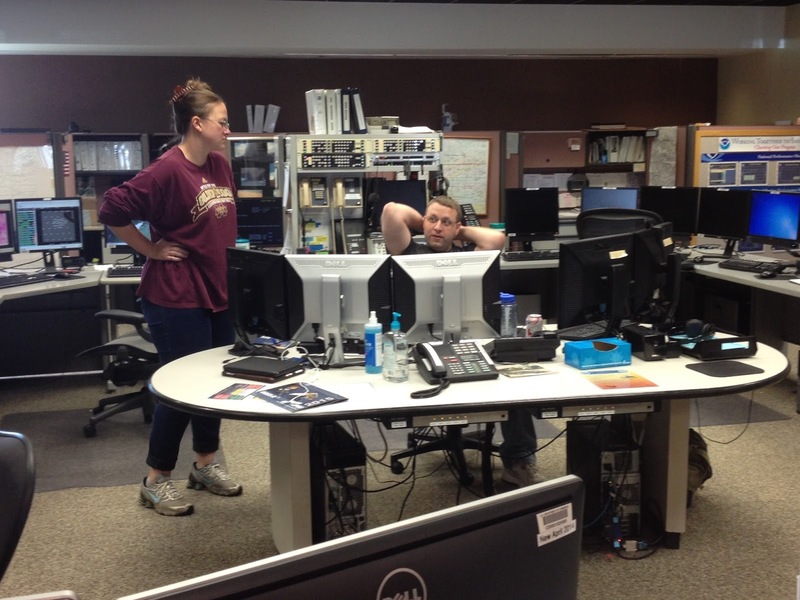 She also explained how the alerts that are broadcast on weather alert radios initiate from their office. 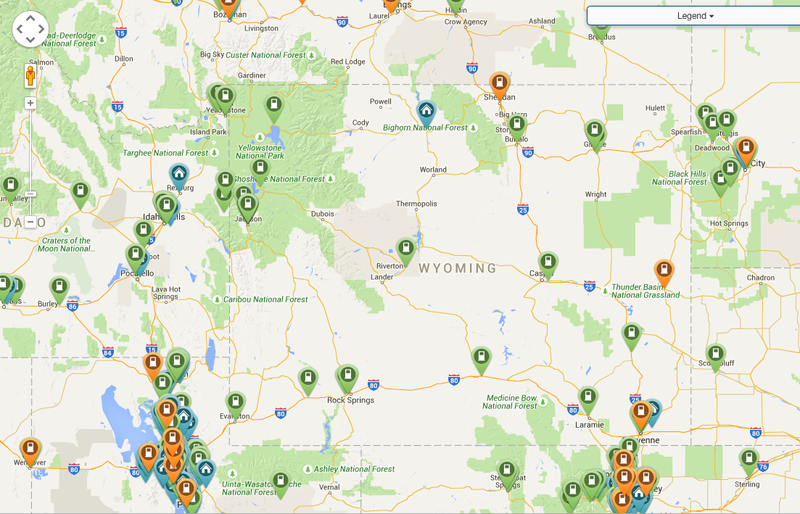 There is a NOAA station in Riverton, Wyoming, too, but I've never been inside the building. I am thankful that these weather stations throughout the country are manned by individuals that keep an "eye on the sky" so we can be better prepared for severe storms. Brenda did a lot of research to find potential places to visit on our trip. She picked some fascinating things for us to see that I'll be sharing for the next week or two. I love to see "new" things while on trips, and these charging stations for electric cars are definitely something that I haven't seen locally. 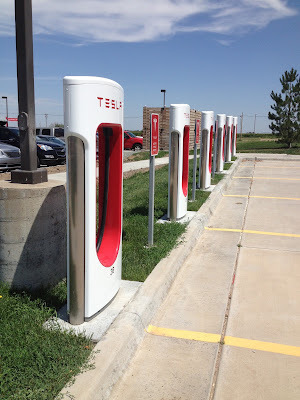 These six stations were in the parking lot of a Holiday Inn Express just west of Goodland, Kansas. I was curious and Googled "electric car charging stations" and discovered there is a station in my community (that was a complete surprise) as well as numerous others in Wyoming. • how long does it take to charge an electric car? • how many miles can an electric car travel on a charge? 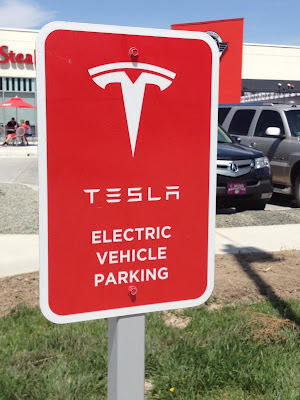 • how much does it cost to charge an electric car? 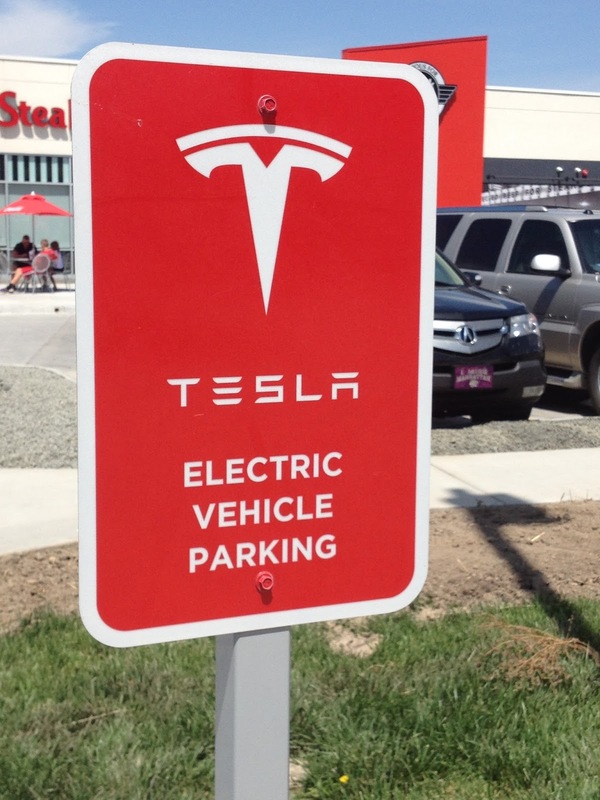 Do you know anyone who owns an electric car and has used a charging station? Have you seen charging stations in your community? I've been knitting my way across Kansas and seeing all sorts of interesting things which I'll share in the days ahead so be prepared. 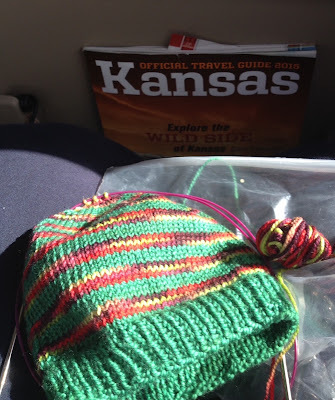 Marilyn (my sister) and Brenda (my niece) and I headed east from Denver and meandered across the entire expanse of Kansas from its western to eastern border as well as a bit into Missouri. 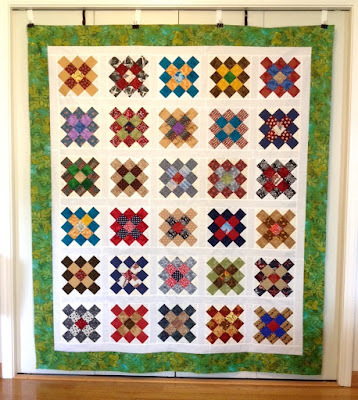 Our ultimate destination was Hamilton, Missouri to see the legendary Missouri Star Quilt Company for ourselves. On our 1,788 mile journey, we saw license plates from 42 states and three Canadian provinces (Quebec, Alberta, and Newfoundland). Plates were not spotted from the states of Hawaii, Rhode Island, North Carolina, Kentucky, Mississippi, Vermont, New Hampshire, or Connecticut. Oddly, we did not see a plate from Montana until we returned to Denver, and that was also where we spotted a plate from Alaska. Obviously, we crossed the American Heartland along with a lot of other people. The hats on the right and left were knit with more than one ball of scrap sock yarn. I alternated the yarn every two rows to give the hat a "planned" appearance. The hat currently on the needles is turning out better than I expected and is being knit with three balls of scrap yarn - one for the brim and the other two for the body of the hat. 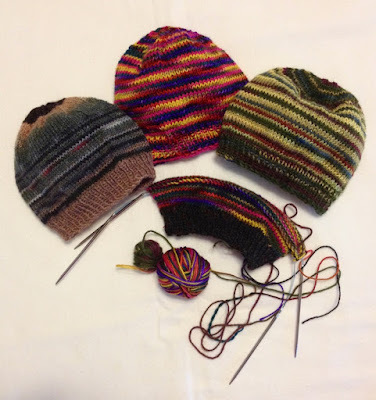 As you can see, the small ball is not going to make it much further so the top of the hat will be similar to the brightly colored hat shown in the middle. Pattern: cast on 90 sts, knit a 1x1 rib for an inch for the brim, stockinette stitch for the body of the hat until it measures 4 inches from the cast on edge, begin decreases (k8, k2 tog for the first row, k all stitches on the second row, k7, k2 tog for the third row, k all stitches on the fourth row) continue in this manner through k1, k2 tog and then the final row is k2 tog, cut the yarn and thread the end through the remaining stitches. Pull yarn to the underside, secure and weave in ends. These hats will be given to the Public Health Nurses for distribution, locally. 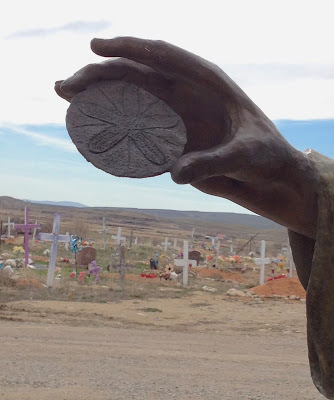 Imagine the wonder that Sacajawea had when she saw a sand dollar for the first time. 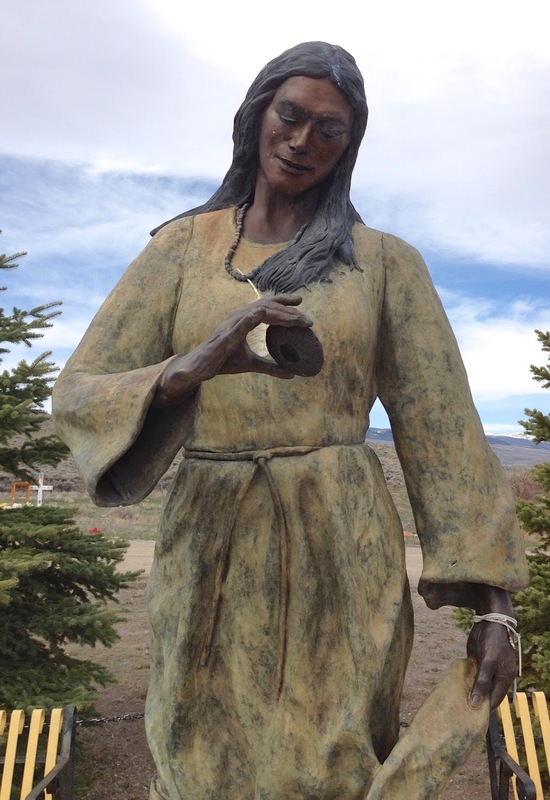 The artist who created the bronze statue of her that stands atop the hill at the Sacajawea Cemetery tried to capture that amazement. 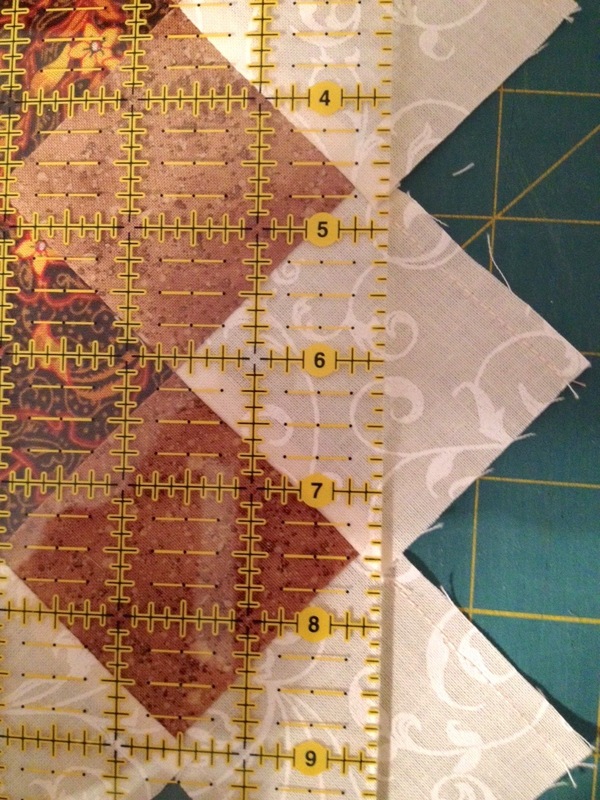 Once all the preparation is done, these blocks go together quickly, and they are ADDICTIVE! 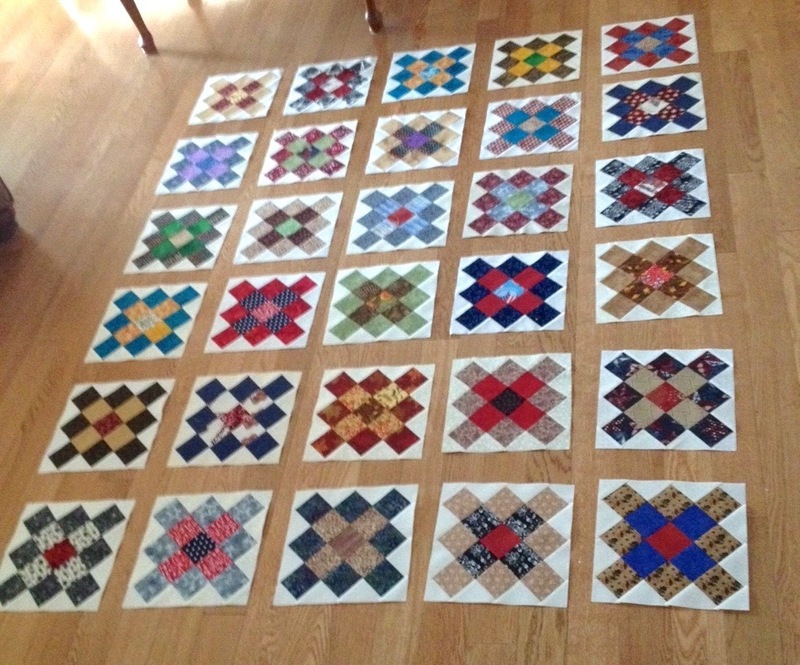 I'm happy that the pile of blocks is growing and that I have nearly enough to make a quilt top. 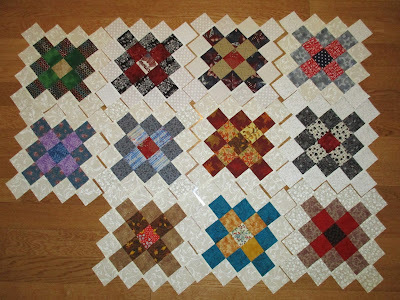 These blocks will be trimmed and sashed with white. 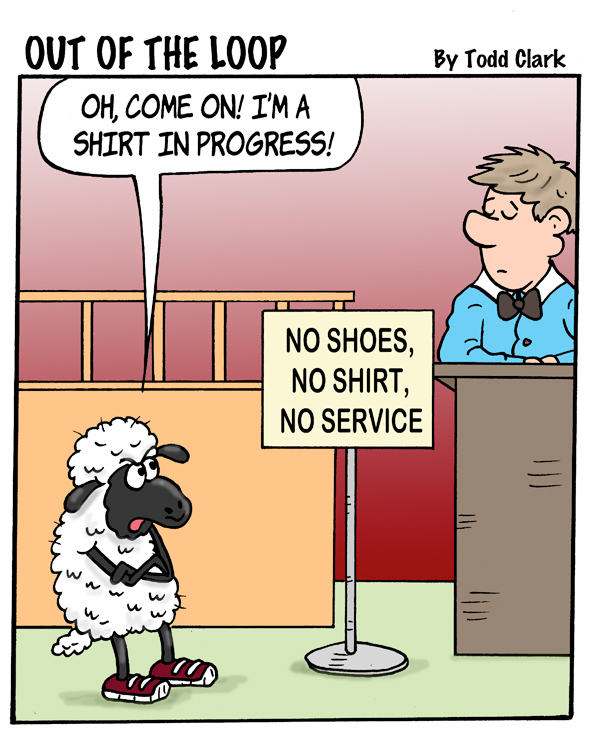 Have you ever been refused service at a restaurant, based on your attire? Aren't these boots fun? The knitter, Sandy brought them to a Fiber Guild meeting before they were felted, technically the term is "fulled," so I was delighted to see them on display at the County Fair. Sandy told the Guild members that she bought the kit for the boots. Well done, Sandy! I think the boots would be a lot of fun to wear.